Since there is currently no complete DIY kit for univibe-like-curcuits, you have to order all necessary parts by yourself. This post is a guideline for this. Remember: its not the only possible way. There are many different ways how to build a univibe and of course its possibel with different parts. Note: Consider also that building the univibe takes a lot of time and debugging is not easy. Note: My step-by-step description always uses the Harbinger One Project as basis. There will be some references to the Neovibe also. Order either at GGG (Neovibe) or madbeanpedals (HarbingerOne). See above. Even the dual audio pot for the speed is available there. The Lamp & LDRs for the univibe has to be ordered somewhere else. Both offers great lamps & LDRs for the univibe. Order all the parts listed in the BOM in the Harbinger One Document (or in the Neovibe doc). Info: Theres no need for a battery clip. Using a battery for a univibe makes no sense, since it wouldnt last very long. 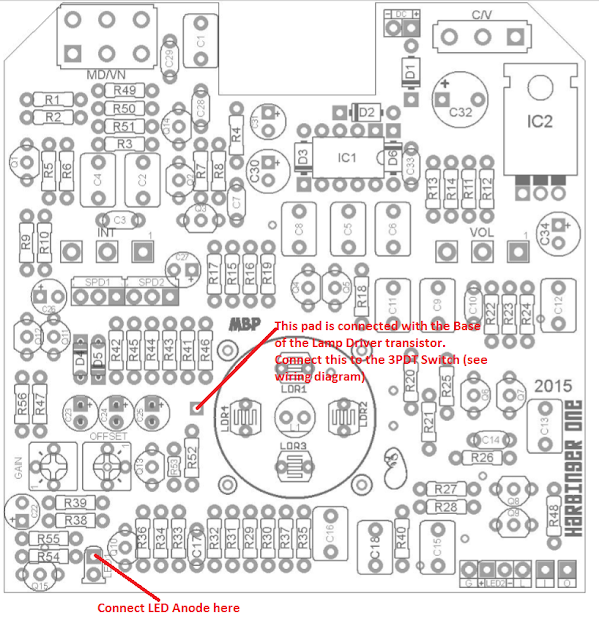 Assemble the PCB according to the document of the Univibe project. Be careful, always check values of ordererd parts before soldering. Note: the harbinger one lists R46 as 47k. According to some builders, it works better with a 4k7! When choosing the HarbingerOne, you also have to choose which power option do you want to use. 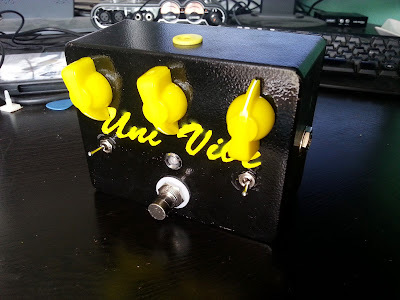 I used the 9V regulated option. So everything has except the filter board has to be assembled. You can also ommit the parts of the filter board, when ordering the parts. This transistor can get warm, since it needs to handle most current of all transistors. May occur, this one needs to be change someday. 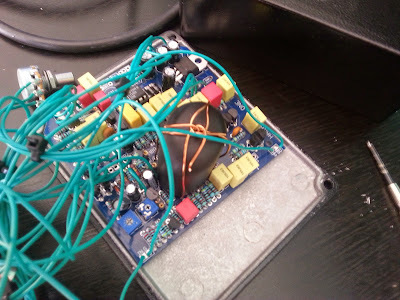 This is the true bypass wiring for the univibe that I used. I think its the most useful wiring. Others use 2 different leds (one as speed indicator, one for bypass), I used only one LED and it also shows selected mode (Chorus, Vibe). To do so, you need a DPDT toggle switch (On - On) for the Chorus/Vibe switch instead of a SPDT. One row of the switch is for the LED, the other is for the Chorus/Vibe switching and must be wired to the PCB (C/V PCB footprint). 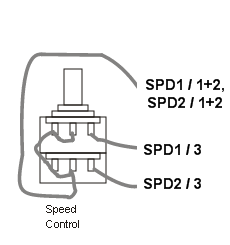 1) Connect the 3rd row of the 3PDT stomp switch as shown in the graphic below. Wire the middle position to ground. One position must be connected to the middle position of the C/V switch, the other position to the Base of the LAMP Driver transistor (Q13). There are printouts for this in the HarbingerOne (Pad directly above R52 in the PCB) and in the Neovibe (CANCEL switch, Pin "X"). 2) Connect the two positions of the C/V switch to the 2 cathodes of the dual color LED. 3) Connect the LEDs anode with a resistor (this is that the LED doesnt burn). I recommend a 330R resistor here. 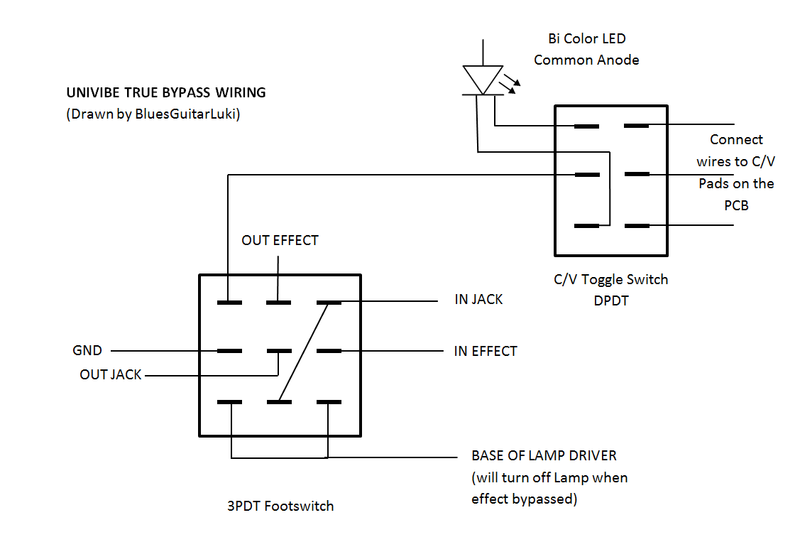 If you want to use a standard LED (one color), you only need a SPDT switch for the C/V switch. In this case connect the cathode directly to the 3PDT pin. 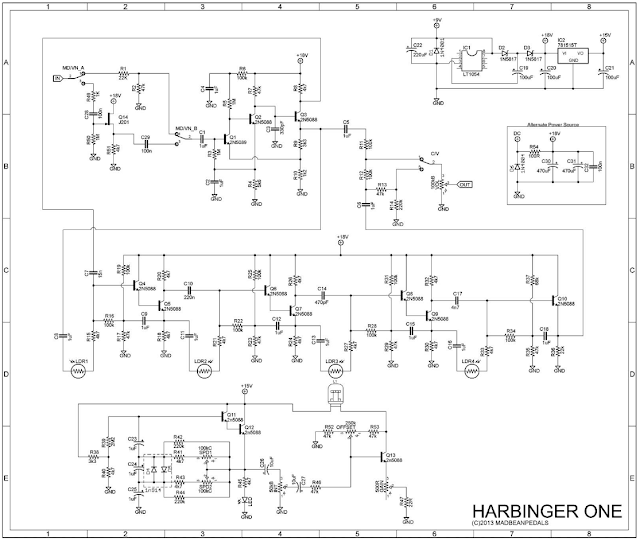 Update: The new Harbinger 2015 version already features a driver transitor for the Rate LED. So you can omit steps 3,4,5,6. Connect the Anode of the LED directly to the positive LED pad on the PCB instead. You can use a 10k trimpot between the LED anode and the Pad to control the LEDs brightness. 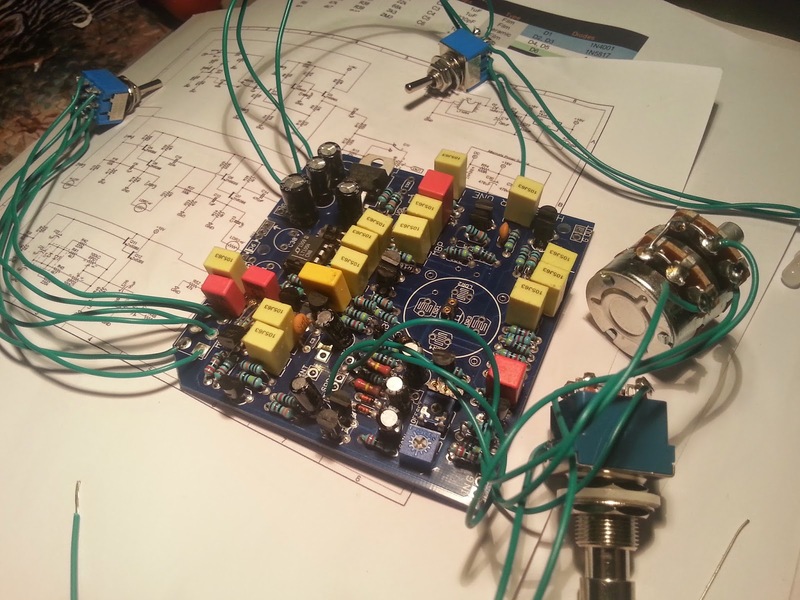 Speed pot is a dual reverse log audio pot. 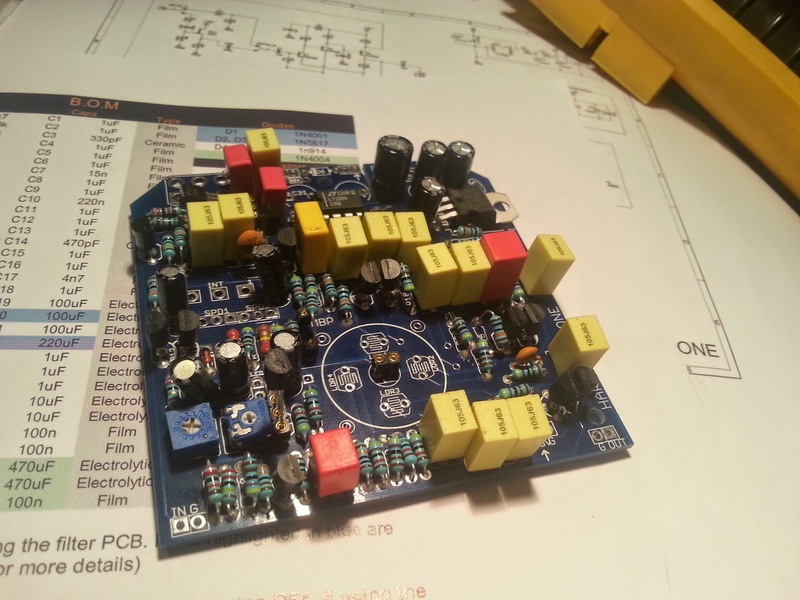 It must be wired and cant be mounted to the PCB. 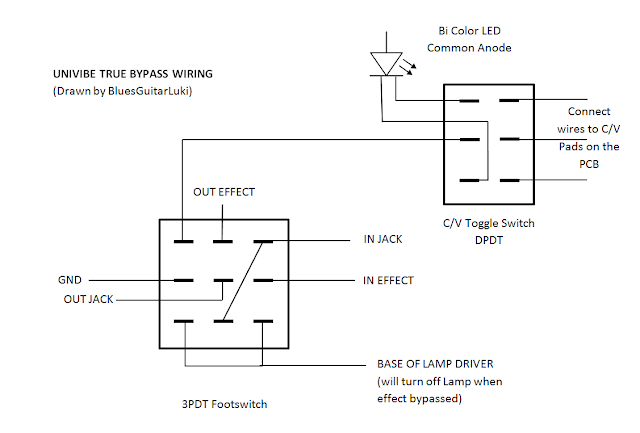 I recommend the wiring shown above, since its the easiest. Pin 1+2 of both pot sides needs all be wired together (additionally also the Base of the LED driver get connected there). 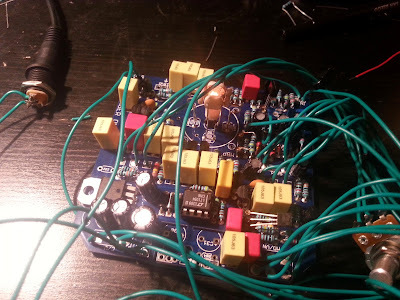 I didnt mount the Volume / Intensity pots and the toggle switches to the the PCB (HarbingerOne). I wired them all, because I wanted a different arrangement of them on my enclosure. 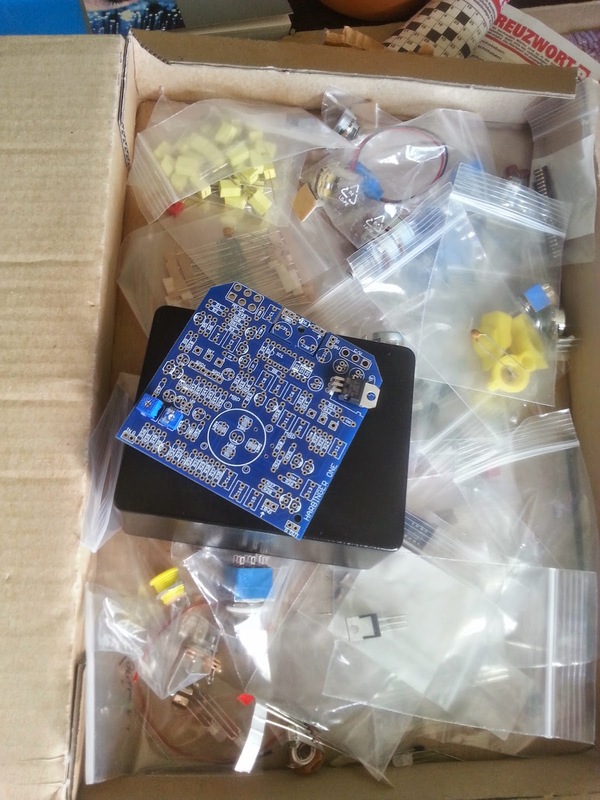 Anyway its easier to mount them directly to the PCB and also safer (less problems). Before preparing the enclosure and building everything into it, I recommend a final test of the curcuit. The curcuit should be working with no problems. If there are problems, debbuging is easier if the enclosure is not envolved. If everything works, you can also setup the OFFSET and the GAIN pot for the Lamp. Theres no perfect instruction for a light shield. Take something that fits. In the Neovibe document theres an instruction to build a light shield yourself out of paper. The light shield can be covered with aluminium foil inside, so that some light gets reflected. In my opinion it doesnt make much difference, since I always point all LDRs directly to the Lamp anyway and I feel that the foil doesnt reflect light that good. For my current build, I used a Cap of an Axe Deo bottle, cut it down a little bit. To mount the light shield, solder 4 solid copper wires to the single pinouts beneath the LDRs. These holes have no connection and serve only for mounting purposes. then install the light shield and wire the coppers together. 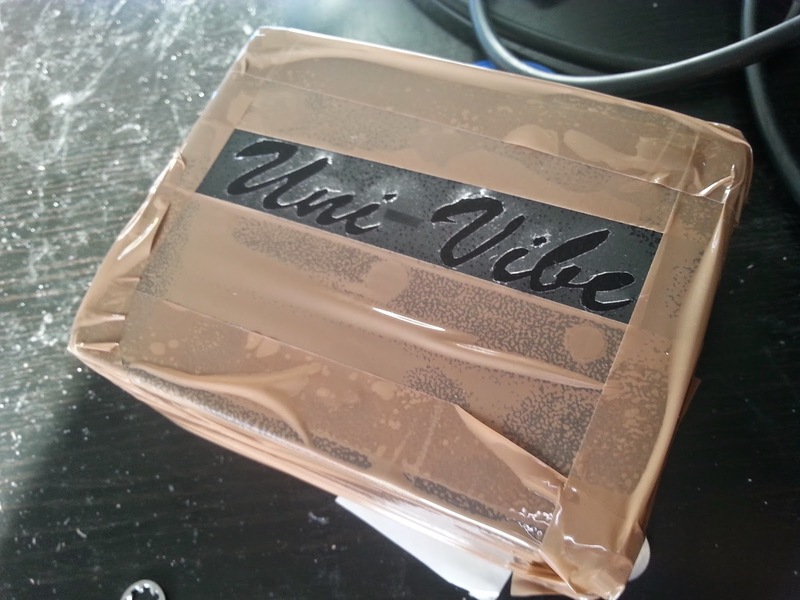 Since theres currently no pre-drilled enclosure available that fits for a univibe, you have to order one and drill it yourself. Since the dual pot and the PCB with the light shield required an enclosure with more depth, common enclosures (B and BB types) wont fit. I attached a drill-plan that I created and used for my vibe enclosure. Its not a direct drill plan, but more a strickle. It can be printed, the squares cut out and then be used for marking the chassis where the holes should be drilled. First picture is for the upside of the enclosure and marks the place of the 3 pots (1st row with the circles), the switches and the LED (led in the middle, 2nd row) and the 3PDT switch (3rd row, middle). Second picture is for the backside of the enclosure for the DC adapter jack. 3rd picture is for the Input/Output jack on the side. Note my drilling instruction is just a proposal. You can arrange the parts as you wish (be only careful that there is enough space for everything inside the box). 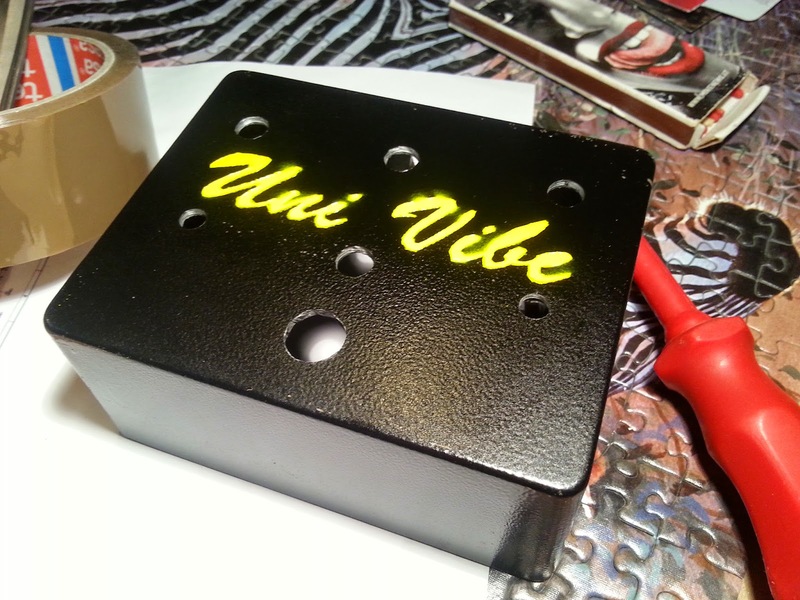 My idea was to paint the Univibe logo on the upside of my enclosure. I used the univibe logo I found in the web. 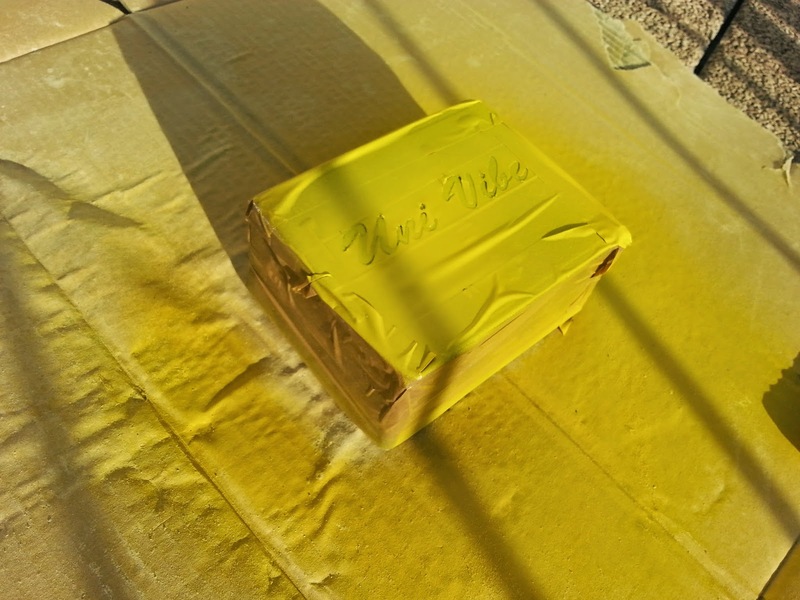 5) Sprayed on the enclosure with a color spray (use some ground coverage for the floor). Dont hold the spray to close to the enclosure. 6) let the color try and repeat step 5+6 two times again. 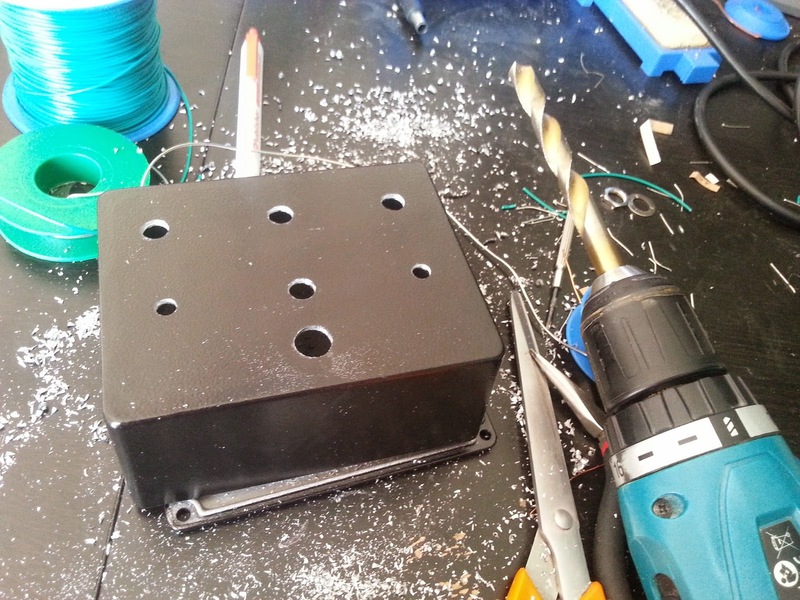 So now you can build everything into the enclosure and mount the knobs! 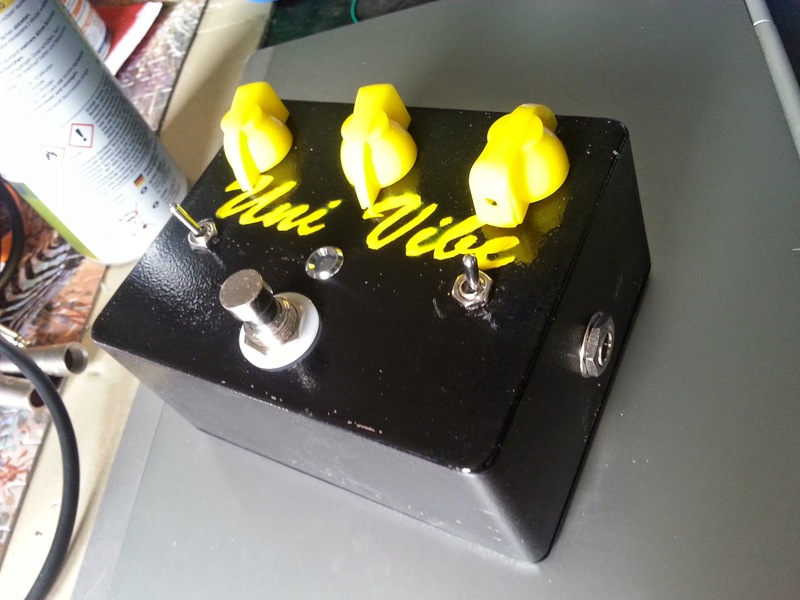 Heres a demo of my Neovibe Pedal. I wrote this article to share all my experience and ideas with you. I really appreciate some comments below. Hi there, just built one and got it working. Interested to know what the benfits are to replacing R46 to a 4k7. 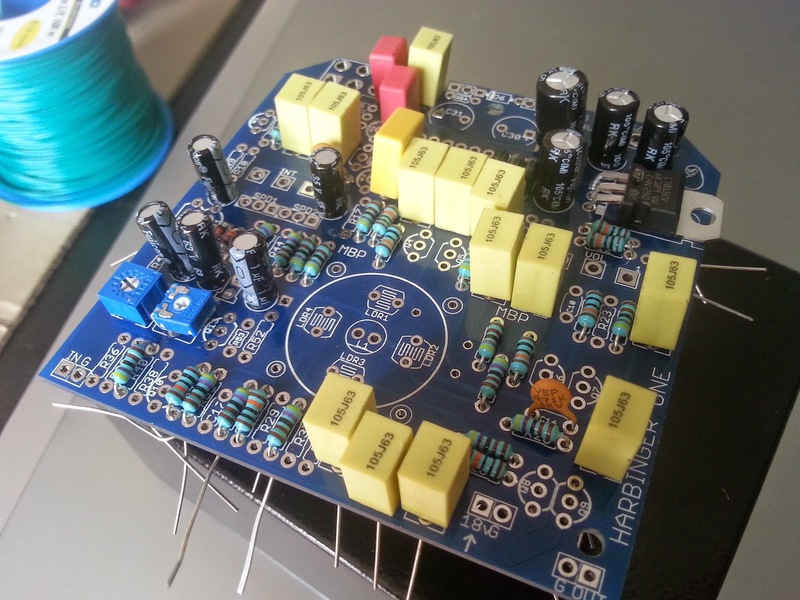 Great blog, found it extremely useful for my build, thank you for posting.